Wonderla - a name which everyone is very familiar in every household, is an amusement park located near Bidadi. Wonderla began its operations in October 2005, since then it has never disappointed a visitor. Since its opening, the amusement park has always been one of the most popular weekend holidays for every individual irrespective of their age group. The park attracts the young and old equally, who enjoy their stay to the fullest from the lazy river, rain disco and the high thrill rides. By Air: The nearest airport is the Kempegowda International Airport in Bengaluru, which is approximately71 km away from here. By Train: The nearest major railway station is the Krantivira Sangolia Rayanna Station or Bengaluru City Junction, which is approximately 28 km from here. The station offersconnectivity to all major towns and cities across the state and as well as around the country. By Road: One of the best ways to reach Wonderla is by road. The place is well-connected by roads and there are regular buses which operate from Bengaluru to the amusement park. Bengaluru via Nayandanahalli, Kumbalgodu, Via Mysore Road, which would take you about an hour or two to reach the destination. The roads leading to Wonderla are well-maintained as the highway connects you to various other major towns and cities across the state. The road takes you through some of the areas on the outskirts of Bengaluru city such as Jnana Bharathi, along with other major places such as Nayandanahalli, Kumbalgodu etc. The 82 acre amusement park is owned by Kochouseph Chittilappilly and his son Arun Chittilappilly who owned the V Guard industries based in Kochi. Wonderla is the second amusement park owned by the group apart from the ones at Kochi and Hyderabad. The Kochi amusement park was intially named as Veegaland, until it was renamed as Wonderla in the year 2011. The park in Bengaluru has 60 odd rides, which are both water and land based. 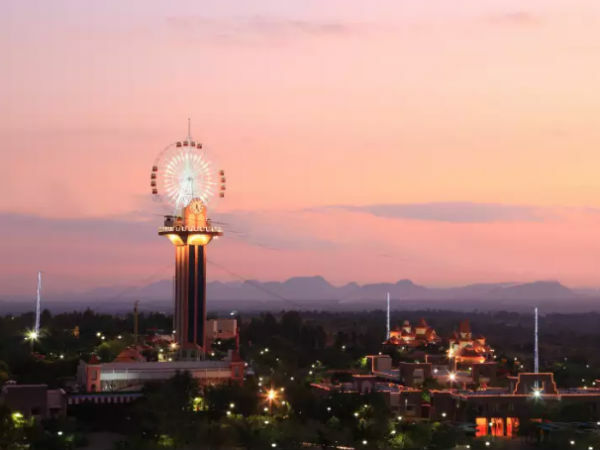 The park offers a wide varitey of attractions which includes some high thrill ones, water rides, a musical fountain, laser shows, VR shows and the major attraction is the giant wheel, which is called as the Sky Wheel. The water in the pools are solar-heated during winters and are cleaned at regular intervals to maintain hygiene. The park has a full-fledged dance floor which comes with a difference; the dance floor has electronically controlled rain showers and this is known as Rain Disco. A recent additon to the park is a reverse looping roller coaster ride which is named as Recoil, which is also the first of its kind to be found in India. If you are someone who loves high thrill rides, then you opt the Recoil, Equinox, Maverick, Drop Zone, Hurricane and few more such rides. There are plenty of water rides, for one to enjoy. There are two wave pools, which generate waves at certain time intervals were you would get a generous splash of a high tide wave and as well a low tide wave. There are many water rides which are indeed very thrilling, which would indeed help you enjoy the day to the fullest. The Wonder Splash is a ride is a must for everyone visiting the park, the ride is a bogie which resembles a raft made of logs which is hauled up a hill by the conveyor which eventually takes you through a tunnel. On emerging from the tunnel, the bogie hurtles down on a steep incline and a high speed and splashes into a shallow pool, which gives you a wonderful spray of water and gets you drenched in the process. For the little ones there are quite a few rides such as the Mini Pirate Ship, Magic Mushroom, Mini Venice, Jumping Frog, Flying Jumbo etc. The park is open from 11:00 am to 6:00pm and during peak days the park is open from 11:00 am to 7:00 pm. The park has two types of tickets, one is the normal one and the other is called Fastrack, which enables you to skip the long queues at the rides. On regular days, the tickets are priced at 1100 for adults and 890 for kids and senior citizens, the fastrack tickets are priced at 1700 and 1300 respectively. On peak days, the tickets are priced at 1300 for adults and 1050 for kids, the Fastrack tickets are priced at 2100 and 1600.